My name is Kirsty, and I am a nursing assistant in St Clare’s Hospice at Home team. I have been working at St Clare for about 3 and half years now – I enjoy my job so much that the time has just flown by! One thing that I have learned during my role is that you should always prepare for the unexpected. Every day can be so different from the day before. Hospice at Home is a palliative care service that provides hands-on personal care during times of crisis when rapid support is needed, on a person’s discharge from hospital, or in the last few weeks of their life. As a Hospice at Home nursing assistant, I support patients, and their families and carers, in their own homes. I offer vital hands on care and support after they have received a palliative diagnosis, whether it is at a time of crisis, or for end of life care. Here at St Clare, we understand how important it is for a person to be able to receive care at home, or even to die at home, if that is what they want. I am there to support them in a way that is right for them. I support patients by keeping them as comfortable as is possible, and managing their symptoms as best as I can. This can include spending the night at a patient’s home; where I will assist with all of their personal needs, to enable them to remain at home if that is where they wish to be. If I am supporting a person who is receiving end of life care, I will also support them and their family through the process of dying, and attend to their personal care after death. This could be things like calling the undertaker, or attending to last offices. During last offices, I will wash a patient who has died, and then dress them at the family’s request in the clothing that they would like. I consider this an honour and a privilege as part of my role. I decided I wanted to work in palliative care after a previous job role as a care supervisor. I noticed that we had started to care for more patients who had been given a palliative diagnosis, and I realised that I did not have much experience in this field. I also worried that some of the carers were also inexperienced, so I decided to attend joint visits with them to boost their confidence and help them to feel less afraid. After this experience, I decided I wanted to work in palliative care full-time. I just felt that there was more that could be done for patients with a palliative diagnosis, and that this level of specialist care and support was different, and of a more sensitive nature, which really appealed to me. I decided to research what types of roles were out there in the specialist palliative care field. 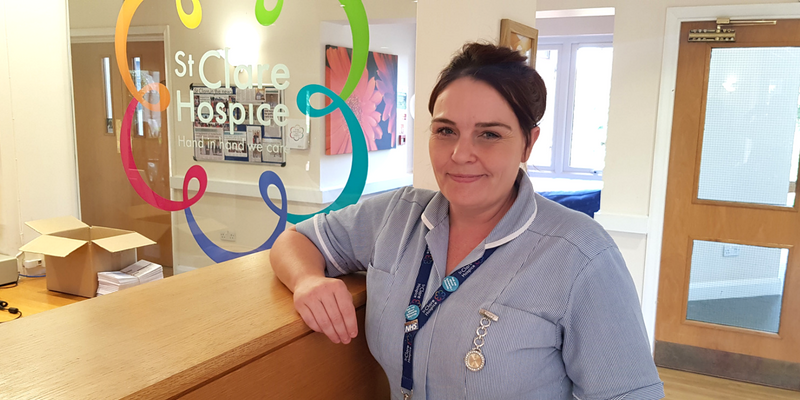 I learned that there were opportunities to offer bespoke palliative care to patients, as a highly-trained registered nurse or nursing assistant, who would have the ability to work in conjunction with other professional palliative care teams. In those roles, there is an emphasis on pain-relief and holistic care. This made me realise that there was more that could be done for people who are facing a life-limiting illness, and I wanted to be part of a team doing just that. So, I studied and finished my college courses, and gained qualifications in the field of palliative care – including my Level 3 and 4 Health and Social Care (and I am currently working through my Level 5 of leadership and management). After that, I applied for St Clare Hospice as soon as I could. I was delighted when St Clare offered me the job! I really love my role at St Clare. I love that we make a real difference, sometimes just by being there and offering emotional support – both to patients and their families, at the most sensitive times of their lives. It is an honour to be able to provide specialist end of life care to those who are in the last months, weeks and days of their lives. My role can be physically and emotionally difficult, but the satisfaction I get from knowing that I have made somebody’s last days more comfortable, is just so rewarding. I vividly remember the first patient who died. I was there from the start, and at the end. His family loved him very much, and as well as supporting him, I supported his wife and two daughters – as well as his young grandchildren. His daughters were a little apprehensive about wanting to be with him at the time of death, but his wife was keen to be by his side. I was on shift and stayed the night as he deteriorated, whilst his daughters went to bed and his wife got tired early in the evening. I reassured her that she should go to bed to rest, and promised that I would call her if anything changed. The patient was dying, but he was also holding on. My guess was that he would hold on until after midnight, because the next day was his birthday! I sat next to him, holding his hand as changes became more noticeable. The clock was ticking towards 12am, and at 11.45pm, his breathing changed. I felt that this would be the time to wake his family. At 12.15am, he took his last breath after his wife and daughters all said happy birthday, and gave him his cards and kisses. From one daughter, he received a medal. As a Hospice at Home nursing assistant, you experience a mixture of emotions when a patient dies. My first experience made me cry, however, it was a happy cry because I was proud that I had been able to support the whole family. All of his family cried, but they were thankful to me for being there for them all. They hugged me, and said that they would never have got through an experience like that if I had not been there. I felt incredibly proud that we could offer such a service from Hospice at Home. I later came to realise that every death is different. Some are peaceful, beautiful and profound, and I will leave the family feeling satisfied and proud that I was able to be there to make things just that bit easier. On rare occasions, a patient may be very agitated and in pain, and it can be difficult to manage their symptoms. This can make you feel frustrated, worried and helpless, as you are battling to do more for them. Sometimes, you feel such sorrow for them that it can make you cry. Everyone is different and all families are different. Sometimes, the patient has no family at all, and this can make me more sensitive and sad. However, most of the time I can feel relieved that everything was okay and privileged that I was there by their side as they died. Many people may feel scared or anxious about being there when their loved one takes their final breath. I always ask the family if they would like to be there, and most families do. When a loved one is dying, family members can be concerned, upset, or even relieved. Sometimes, people can feel a mixture of all these emotions, and that is absolutely fine. Most of the time, the family all sit around the bedside, content for me to just be there. Or sometimes I will be in another room, and family members will call me to see what I think and to share an update on the patient’s condition. I am there for everyone, showing empathy and compassion. I offer open arms for comfort. Sometimes, family members will come to me for comfort and a chat. They will share with me how thankful they are for the support of St Clare Hospice in helping them, and I reassure them that they did great, supporting and enabling the patient to be cared for at home. We will do our upmost to keep a patient comfortable up until their very last breath. Sometimes, people can still hear even when they appear unresponsive. I encourage families to tell them anything they would like to say. I encourage them to hold their hand, and let them know that they are with them. It can be comforting for the patient if you play their favourite music in the background, or read a favourite poem, spiritual passage or prose that means something special. Lowering the lighting so there are no bright lights on the patient’s face can also help to keep them more comfortable. If I am visiting during the night, and the family are tired, I reassure them that I will try to wake them if there are any changes. Sometimes, this may not happen, as the patient may pass suddenly and quickly with no warning. However, I promise that I will try. Sometimes a patient may appear to be hanging on, so I may suggest to families to sit in silence or perhaps for just one family member to remain in the room and sit quietly, because often a person will pass away peacefully after a room has emptied as it is quiet. Being with someone when they die can be a very spiritual experience for many people. There is something about the feeling in the atmosphere after someone stops breathing. Alternatively, it may feel rather hollow. The life and essence of a person has now gone, and it can feel like only an empty shell has been left behind. There is no right or wrong way to feel when you are with someone during their death. When the moment of death happens, it can be very quick and sudden. It is impossible to predict the exact moment when it will happen. After the patient dies, I support the family. I let them find their own way of dealing with what has happened. Families may feel sadness, anger, guilt – all kinds of different emotions. Sometimes, they may feel relieved, believing they will be in a better place. Some people feel angry that their loved one is leaving them, finding it hard to accept. I have seen a lot of sadness, but I feel that families being there as their loved one dies, can help so much in so many ways. It is completely normal to feel disconnected from reality after watching a loved one die. People may feel like they are in a dream, or that things don’t quite seem real. After witnessing the death of a loved one, people may also feel like they are confronting their own mortality, not quite knowing what to do with themselves, deeply questioning everything and feeling lost. During the first couple of hours of having lost someone, I listen to and comfort the family as best as I can, until I ask what they would like to happen next. I offer to give last offices, which is sometimes accepted. I lay the patient on their back, and wash and dress them in their own clothes. They will look like they are sleeping. This can help a family feel at ease and offer some comfort. Sometimes families would like me to leave them alone with the person for a little while – and that is also absolutely fine if it is what the family wants. It can be a very healing moment, and reassuring and peaceful for loved ones. Then, I will lay the patient flat, call the GP or 111 if it is out-of-hours, and ask a doctor to come and verify the death. Then, the family can arrange for an undertaker to take the patient. I have been there for many people as they have died. Seeing so many people die can be really difficult emotionally, for any palliative care professional, but I cope by knowing that I have made a difference to a patient and their family at one of the biggest moments of their lives. Every person who I support is different, and it can sometimes be challenging or beautifully peaceful. Patient empathy can be a powerful tool for making you a successful nurse or nursing assistant, but it can also make loss more painful. When a patient dies, we also feel grief. How we grieve feel can depend on how long we knew them, or sometimes if they remind you of a loved one, or friend, or parent. When you feel deep empathy, the death often becomes more personal and upsetting, but I have to remind myself that caring for people who are dying is my work, and not a part of my personal life. As much as I may feel grief for a person I have cared for who has died, I remind myself that the grief I feel means I did my job well. Also, whatever I feel upon a patient’s death, his or her loved ones could feel much more. We are the first people a family encounters after their loss and we need to be there to comfort them. How you treat and talk to a patient’s father, mother, sibling, son, daughter, friend – or any family member – is an extension of the care you were providing to the patient. We can make a tremendous difference in both a patient’s and their families’ lives, which will help the family, cope with their loss. And it can also help us too.